Happy Hispanic Heritage Month! As an agency that serves over 800 Latino Littles, we thought it would be important to celebrate with Hispanic Mentoring themed blogs throughout the month. This week, we spoke to Helyn, who is a mother of three Little Brothers in our program. After struggling with domestic violence, Helyn is incredibly open and honest in her reflections in the following blog post. 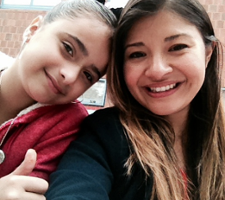 Her story is moving and we hope you can appreciate why having a mentor in the Latino community is so important. Feliz Mes de la Herencia Hispana! En nuestra agencia nosotros servimos más de 800 niños Latinos. Queremos compartir con ustedes varias historias de nuestra agencia para poder celebrar nuestras familias, voluntarios, y el trabajo con los latinos. Esta semana, hablamos con Helyn, la madre de 3 niños que son hermanos pequeños en nuestro programa. Después de luchar contra la violencia doméstica, Helyn fue muy abierta y honesta en sus reflexiones con nosotros. Su historia es muy emocionante y esperamos que usted pueda apreciar la importancia de tener mentores en la comunidad Latina. Tell me about your background, where did you grow up? Dígame sobre usted, de dónde eres? Como fue su infancia? Cuénteme sobre usted, de dónde eres? Como fue su infancia? I was born in Llanos Grande, Guatemala. I lived with my parents and 10 siblings. We lived in farms, and were a big family, which I miss so much. I came to the Boston more than 20 years ago, and hope one day I will go back. Yo nací en Llanos Grande en el país de Guatemala. Yo viví con mis padres y mis 10 hermanos. Vivíamos en una granja, éramos una familia muy grande, y extraño mucho eso. Vine a Boston hace más de 20 años y espero volver un día. Tell me more about your son, what is he like? Dígame un poco de tu hijo? My son is a very quiet kid. Shy of everything and mostly everyone as well. He cares a lot for his family, and loves to play video games. Mi hijo es muy callado y reservado. Él es muy tímido con todo y con mucha gente. Él es muy cariñoso con su familia y le gusta jugar mucho con sus video juegos. 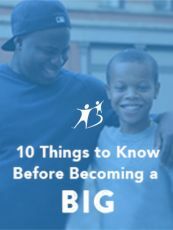 Initially why did you sign up your son to Big Brothers Big Sisters program? Inicialmente porque quería que tu hijo tenía un Big Brother? I felt that I couldn’t take him many places, and would not be able to connect with him when visiting these new places. And hearing the program from his school, I immediately thought this would a great opportunity for him, where he would be able to get the most out of it and have a great experience. 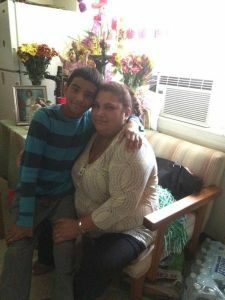 As a family, we have suffered from domestic violence, and it has been super hard on Christopher since he was little. He only started to speak at all when he was around 5 years old. I am so grateful for this program and think it is the best thing that has happened to me and my son. All my family is back in Guatemala, and Big Brothers Big Sisters of Massachusetts Bay is the only family I have in the USA. Yo sentía que no podía sacarlo a muchas partes y no podía conectarme con él cuando íbamos a lugares nuevos. Primero oí del programa en su escuela, y inmediatamente pensé que esto podría ser una oportunidad muy buena para él, donde él podría sacar mucho del programa y también tener una buena experiencia. Como una familia, nosotros hemos sufrido mucho de la violencia doméstica, y ha sido muy duro para Christopher desde que era chiquito. El solo comenzó a hablar cuando tenía 5 años. Yo estoy muy agradecida por el programa y siento que es lo mejor que ha pasado para mi hijo y yo. Toda mi familia está en Guatemala y Big Brothers Big Sisters of Mass Bay es la unica familia que tengo aqui. What is your favorite memory of seeing your son and his big brother? Cuál es la memoria favorita de su hijo con su Big Brother? My favorite memory of them, is the first time they were introduced. Christopher was very shy, and kept asking why he had to take a picture with Big Brother. It was just a beautiful thing to see. Mi memoria favorita de ellos fue el primer día que fueron introducidos. Christopher estaba bien tímido y seguía preguntando porque tenía que tirarse una foto con su Big Brother. Fue una cosa tan hermosa de ver. 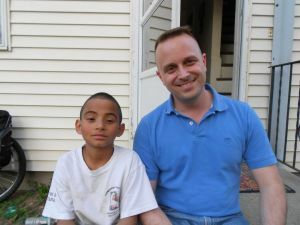 What are some outings your son and the Big Brother have done together in their years of friendship? Que son algunos de las actividades que han hecho tu hijo y su Big Brother? They have been to many places. Canobie Lake Park, Water Country, Six Flags, Church and even stepped into a helicopter, which for him was so amazing. Ellos han salido a muchos lugares. Canobie Lake Park, Water Country, Six Flags, la iglesia, y hasta se han montado en un helicóptero, que para él fue muy asombroso. If you could describe your son’s Big in one word what would it be? En una sola palabra, describe al Big Brother. Maravilloso! El es una persona maravillosa. What are some changes you’ve seen in your son since being matched? Ha notado algún cambio en su hijo después de tener a un Big Brother? Yes, Christopher speaks much more. He is now more open to communicating with friends and adults. Same goes for school, he is doing better in School. More outgoing, and always excited to be out with his Big Brother. Si, Christopher habla mucho más. Él ahora está comunicándose más con sus amigos y adultos. Lo mismo con la escuela, a él le va muy bien en la escuela. Está más simpático, y siempre está bien emocionado cuando ve a su Big Brother. How important is the role of Match Support to be able to speak Spanish as well? Also how important has it been to have a Big Brother that speaks Spanish and has similar background to your son? Cuál es la importancia de tener el suporte de emparejamiento, y porque es importante que ellos consiguen hablar español también? For me it is very important, especially because I don’t speak much English. I think it lets us Spanish mothers be more comfortable and able to trust the Agency more. We, mothers, are always afraid of going to a place where they only speak English, because since we don’t understand very much, we never fully trust them. But with Big Brothers Big Sisters, it is so easy to talk to them and being able to understand what is going on with my son and his Big Brother. Para mi es bien importante, especialmente porque no hablo mucho inglés. Yo siento que a nosotras como madres hispanas, nos hace sentir muy cómodas y podemos tenerle más confianza a la agencia. Nosotras, madres muchas veces tenemos miedo de ir a un lugar donde solo se habla inglés, porque no entendemos mucho y no le tenemos mucha confianza. Pero con Big Brothers Big Sisters, es bien fácil hablar con ellos y poder entender que está pasando con sus hijos y su Big Brother. We have a hard time finding Spanish speaking mentors/Latino Bigs in the Boston community. Why do you think that is? Nosotros tenemos muchas dificultades en encontrar voluntarios que hablan español en Boston. Que piensas sobre eso? Porque será? I think it’s because we are so focused on our families, and we don’t see that we could all help each other, by giving back. Yo creo que es porque los Latinos nos enfocamos mucho en nuestras familias y no vemos que nos podemos ayudar más, y apoyar a otros niños. What advice would you give other mothers who may be hesitant to provide another role model to their child? Que consejos daría a las otras madres que están con dudas para tener otro modelo positivo en la vida de sus hijos/as? I would tell the mothers not to be afraid, go after something that is good for your family. Have a positive role model be part of your child’s life. Yo le dijera a las madres, que no tengan miedo, que hagan algo bueno para su familia. Que tengan un modelo positivo que pueda ser parte de la vida de su hijo.